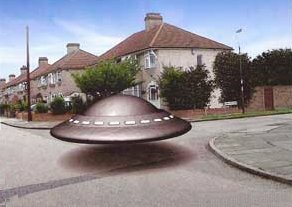 IT WAS July 17, 1955 when Margaret Fry spotted the object as she was making her way to her GP's surgery in King Harold's Way from her home in Hythe Avenue. Both she and her doctor Dr Thukarta, and around a dozen children playing in the street, saw the strange craft. Mrs Fry described it as saucer shaped with a "blue/silver/grey/pewter texture, yet none of those colours." She said it had three spheres set into its base, one of which "flopped out", landing on the ground at the junction of nearby Ashbourne and Whitfield roads. The children went over for a closer look before it rose into the sky and disappeared from view after a few minutes. News Shopper ran an appeal in 2002 for any of the children to come forward. Rodney Maynard, who was in his 60s and living in Belvedere, remembered the incident vividly. He was 15 at the time and working as a labourer on the building site in nearby Streamway. Mr Maynard said: "We were on our lunch break when we heard something was happening in King Harold's Way. So we went up there to have a look. "This thing had landed in the road." He added: "It took up the whole width of the road and overlapped onto the pavements. It wasn't on the ground. It had about eight massive suckers.The centre was still, but the outer rim was spinning slowly and it had white lights flashing, like a camera flash." He said there were about 30 people watching it and they could hear it humming. Mr Maynard recalled: "It had what looked like windows, but the glass was concave and moulded together so you could not see in. "A couple of us went forward to try and touch it, and it began to spin faster." He said the craft then lifted slowly, tilting lightly and hovered above their heads. Then it moved slowly until it was over Bedonwell Primary School, where it hovered again for about a minute. Mr Maynard said: "It shot up into the sky and disappeared." He says his brother, who was 16 at the time, also saw it. Mr Maynard says the craft was "black, sleek and streamlined, with a surface like polished metal." He added: "It was very fine and beautiful. It wasn't a prank." Mr Maynard said he had never forgotten the experience but did not talk about it because "people would think you were barmy". He said he and his friends used to talk about it among themselves, "but our mums kept telling us we had not seen anything". Mrs Fry, now in her late 70s, now lives in Abergele in north Wales. She relives the experience in her book entitled Who Are They? and gives details of other UFO sightings in the Bexley and Kent areas. Mrs Fry has also been helping UFO enthusiast and retired policeman John Hanson with his books on the subject. He has been trying to track down other witnesses to the July 1955 incident, some of whom were named by Mr Maynard as Ron Deadman, Tony Savin, Vic Clarke and Tommy Staggs. If you witnessed this incident, call News Shopper on 01689 885723.